NECO, Internal Cups, Sealed Cartridge, Tapered 1-1/8" to 1-1/2"
To run the forums, host the website, and travel, I charge a universal service fee for my reviews. 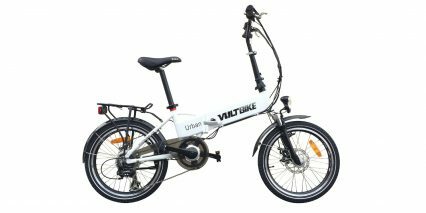 This review was sponsored by VoltBike. 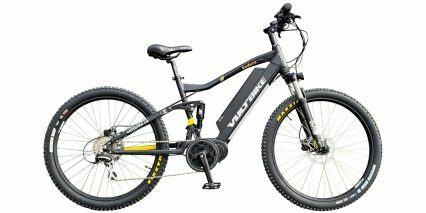 My goal is to be transparent and unbiased, this video and written review are not meant to be an endorsement of VoltBike products. 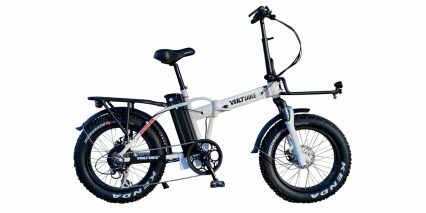 New and updated for 2019 is the VoltBike Enduro, a lower cost option for those looking for a full suspension mid-drive mountain bike. 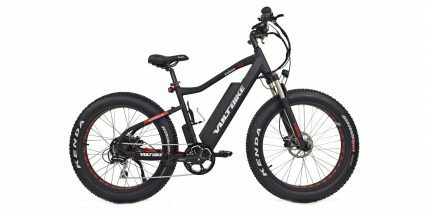 The bike starts at $1,999 in the US and $2,499 in Canada. 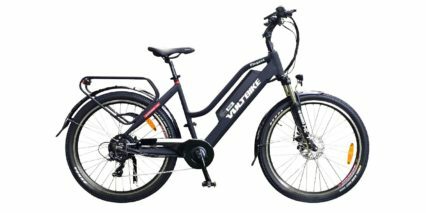 VoltBike sells primarily online, so shipping is typically about $50 in the US, or if you are in town in Vancouver, B.C., you can always swing by and pick one up without having to pay shipping. I reviewed this bike some time ago, and it looks like all the best features are still here, along with quite a few upgrades. The major changes here are a higher capacity battery, better tires, and the bigger hydraulic brakes, but we will get into more detail with all that soon. For now, I want to mention that although it comes in just 1 frame size and 1 color, it is still very approachable with this sloped top tube. A lot of adjustment and comfort here too. 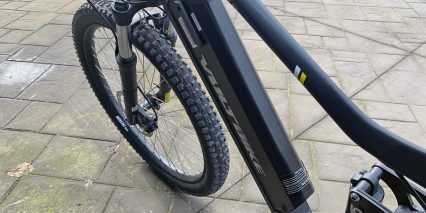 Like these Maxxis Minon DHR2 high volume tires, a big upgrade from the previous version, these are 27.5” x 2.3”, so not quite a plus size, but close. 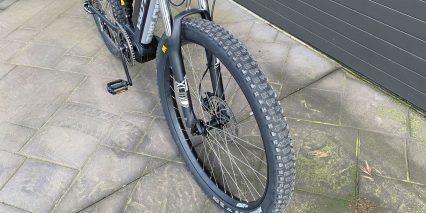 You’re getting great tread EXO puncture protection, 33-60psi, and they are tubeless ready which is really cool. 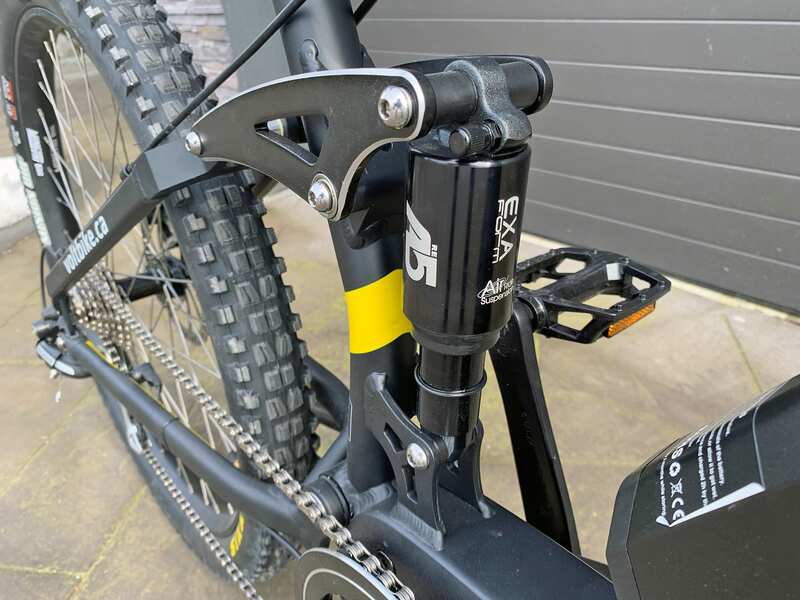 I also noticed a quick release in both the front and rear, this is a really nice feature to have on trail or mountain bikes and makes maintenance and loading/unloading easy. 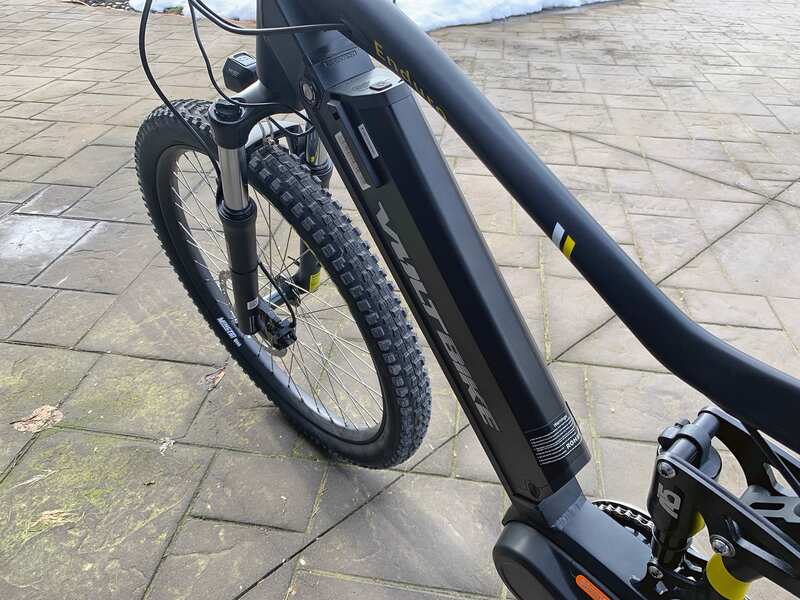 The front suspension is an SR SunTour XCM spring fork with 30mm stanchions, lockout compression slider, and preload adjust. This is also attached to a tapered headtube, so you could swap out the fork with another one if you wanted. 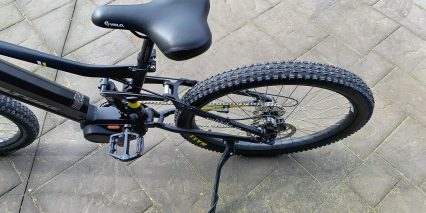 The rear suspension is an EXA Form with 80mm of travel. The rear suspension is great, but I am not seeing a lot of adjustability here, but that could be one way they keep the cost down on this bike. 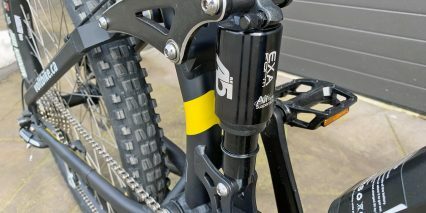 Also new for 2019 is this 70mm adjustable stem with a bit of a rise. 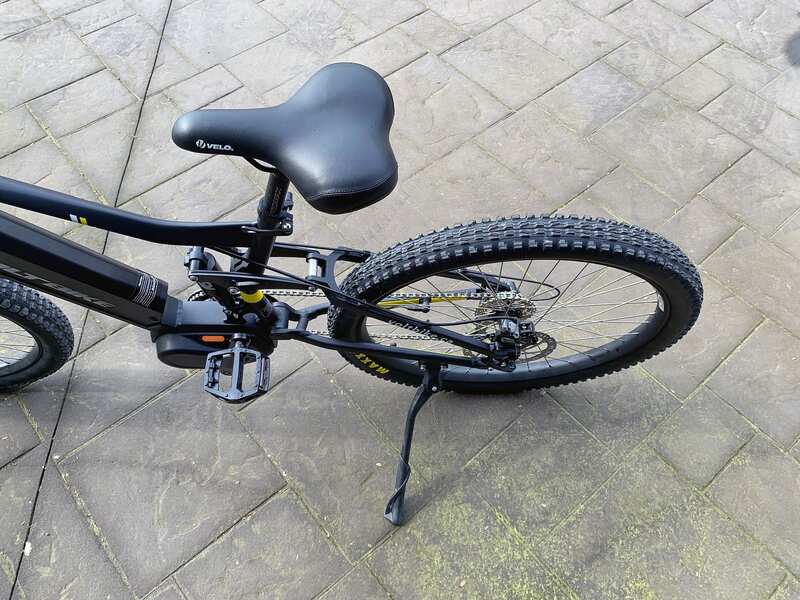 It is a great addition for riding around town or light trails, but if you wanted a more aggressive position, you may want to swap it out with a more rigid stem since it would be less up-right and give you a little more feedback when navigating bumps. 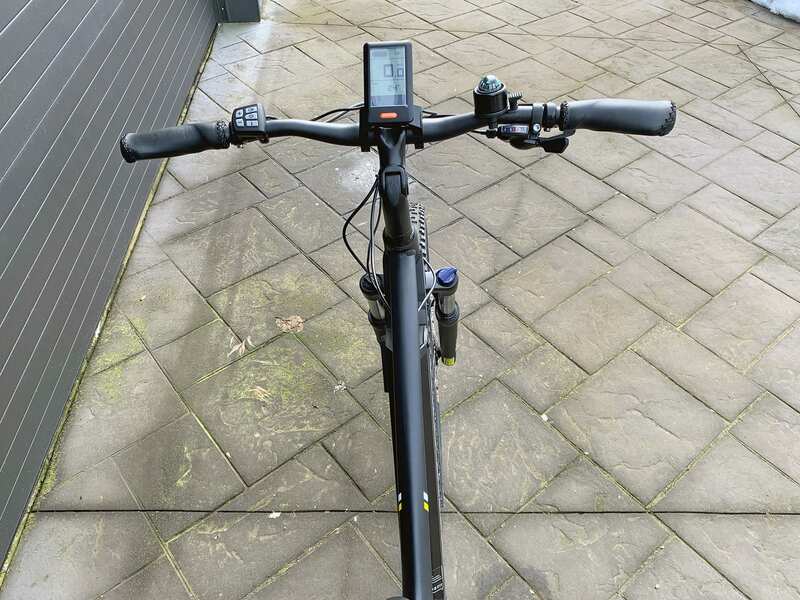 It looks like the seat post here is 27.2mm so you could swap that out too depending on if you wanted a more or less rigid setup. 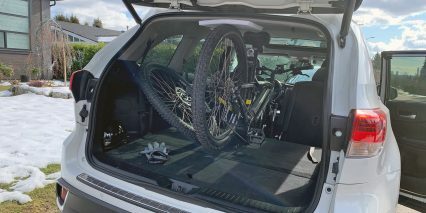 Overall though, I would say the bike is more of a cross-country setup and not as much a trail rated bike. It weighs 59.5lbs which is a bit heavier, but that is probably due to the larger tires and bigger battery pack. 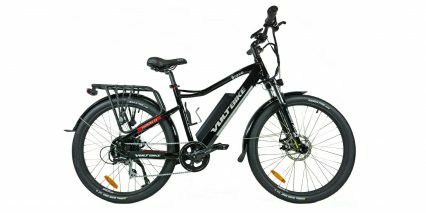 It does handle that weight well, thanks to the battery placement and the mid-drive motor, I found the bike to have good weight distribution. Although there is no rear lights, I do like that there is a battery integrated headlight. 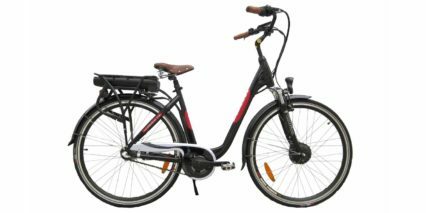 The headlight though is mounted on the arch of the front fork though, so do be mindful that it could bounce up and down during a ride. Looking around I see a lot of internally routed cables which is cool and I really love these Wellgo extra wide pedals. 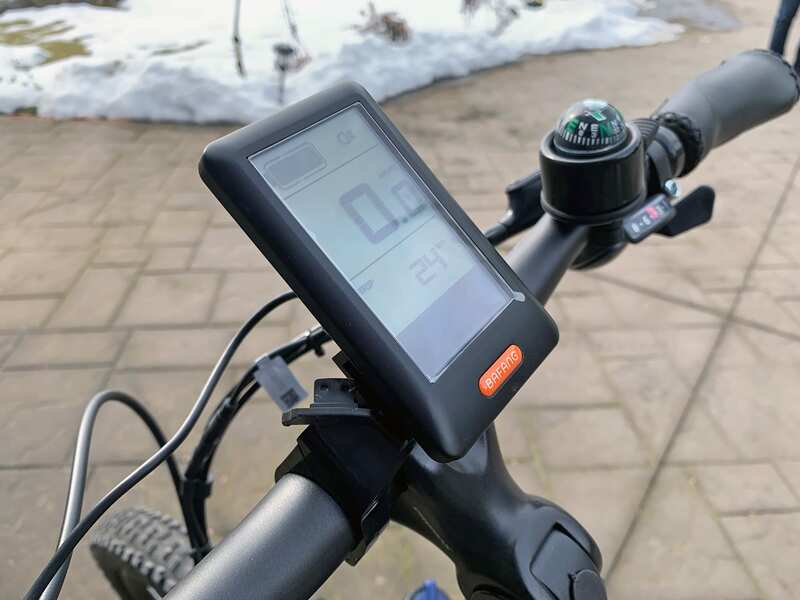 Other features include stitched faux leather ergonomic grips, rear kickstand (which I think is neat is on a full suspension bike and is positioned out of the way), and this integrated compass bell. No bottle cage bosses here, but that is actually somewhat common for full suspension bikes. 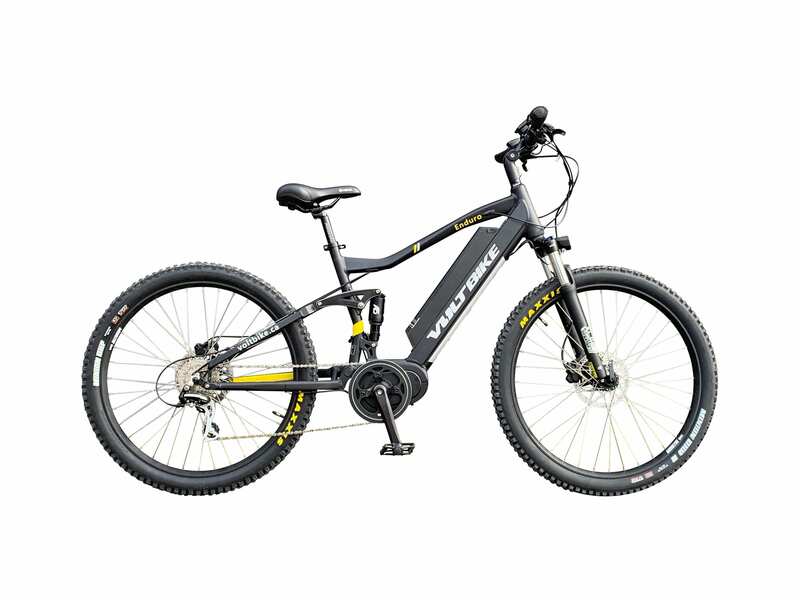 Driving the bike is a 350 watt nominally rated mid-drive with peak torque output of 80 Newton-meters. The numbers put it in the same performance range as Bosch, Brose, Yamaha and Impulse which cost much more. In that same vein, there is no throttle here, just pedal assist from its torque and cadence sensors. It’s fairly compact, but not as good looking as some of the Bosch tilted designs, and it’s one of the quietest offerings around. The areas it doesn’t stand out so much are zippiness and RPM output. Basically, you need to switch gears more actively while pedaling to accelerate quickly and ultimately reach higher top speeds. In these ways, it reminds me of the base level Yamaha mid-drive. 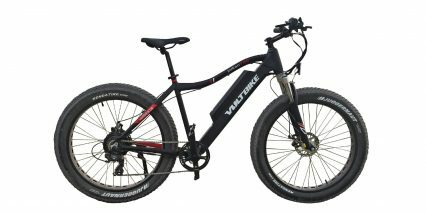 For the price, it’s a big jump up from geared hub motors (used on all of the other VoltBikes at the time of this review) and it got me up 12% grades on a rocky dirt trail in Colorado without any issues. Of course, my speed hovered around 8 mph during these stretches… but that’s because I remained seated and focused on balance and handling vs. speed. 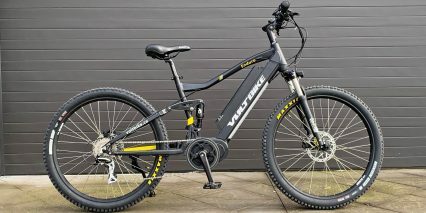 Interestingly, the Volt Bike Enduro arrived with a maximum speed setting of 25 km/h which is roughly 15.5 mph. This is below the legal limit in the United States and Canada so I unlocked the display panel by pressing the i button twice quickly then used the password 0, 5, 1, 2 to raise the limit to 32 km/h. 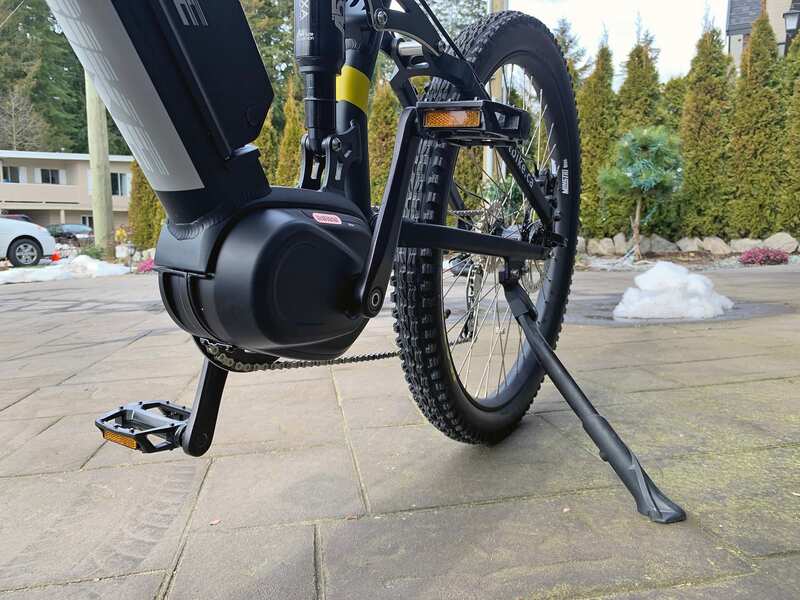 This made it a Class 1 trail-legal electric bike… but later on, I raised it further to 60 km/h (which it doesn’t actually hit) to get an effective speed of ~28 mph. 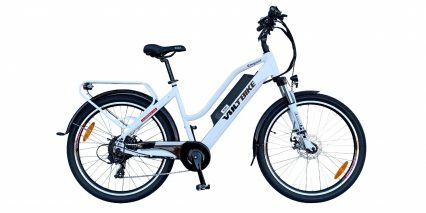 Basically, this can be a Class 1 or Class 3 speed pedelec which makes it a contender for urban commuting if you ride on street bike lanes. 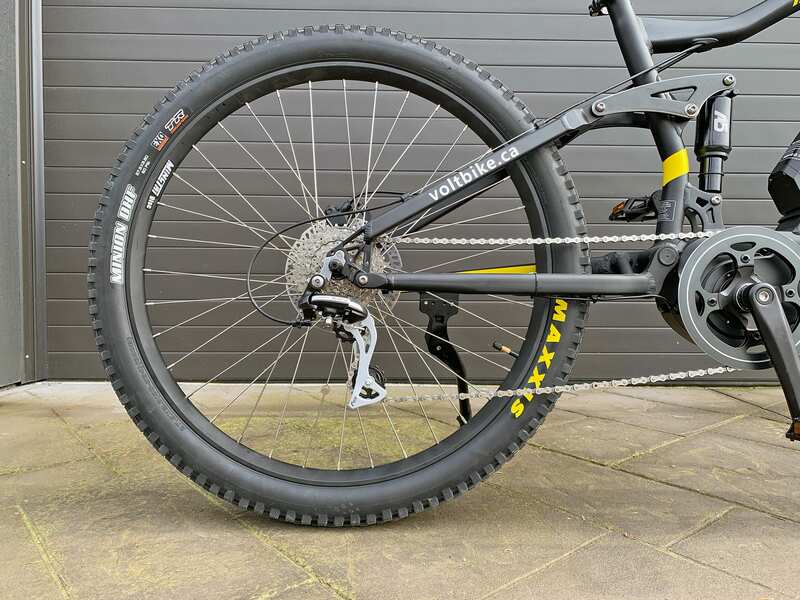 Mechanically the bike sports Shimano Acera components which is 3 steps up from the entry level, a welcome addition to the other aspects of the bike. It is an 8 speed 11-32 tooth cassette which is, again, better than most entry level setups. 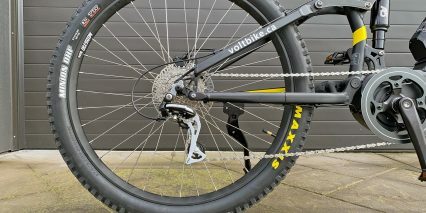 In the front you get this 170mm crank arm with a 44 tooth chain ring with an alloy guard. 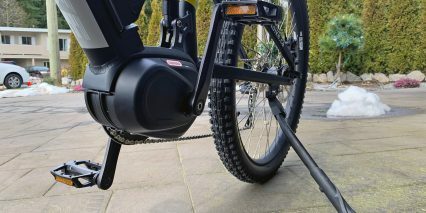 For stopping power, the bike has been upgraded from 160mm to 180mm Tektro hydraulic brakes. No motor inhibitors here, but that’s not so bad since there is no throttle and the system measures out everything for you. 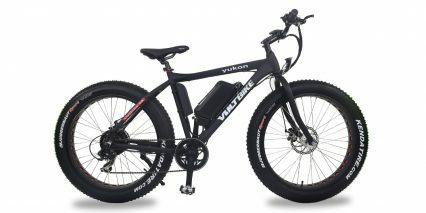 Powering the bike is what I would consider a pretty big win and big upgrade… a massive 48v 14.5ah battery. 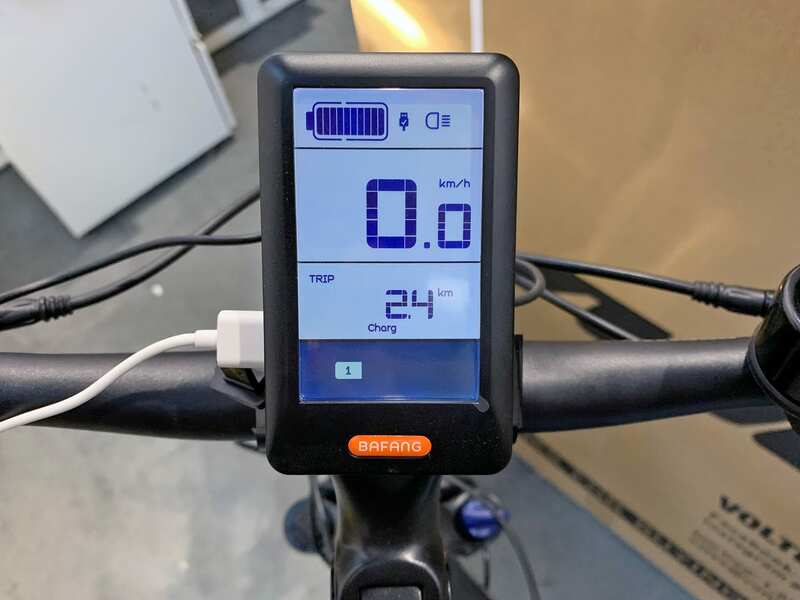 This is such an impressive high capacity battery that most companies (if they even have something similar) charge a large upgrade premium to add it to the bike. This is almost 700 watt hours and really just there for both power and range. It looks like the battery weighs about 8.9lbs and is using brand name Panasonic cells inside. The pack also has a USB port at 5v and 500ma, so enough to charge a smaller device, but not powerful enough for an iPhone. 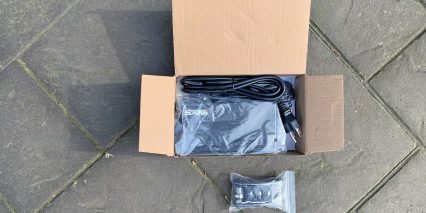 The charger here weighs about 1.5lbs and is a 2amp charger. 2amp chargers are a little on the slower side, but charging at a slower pace can actually help the battery life cycle. 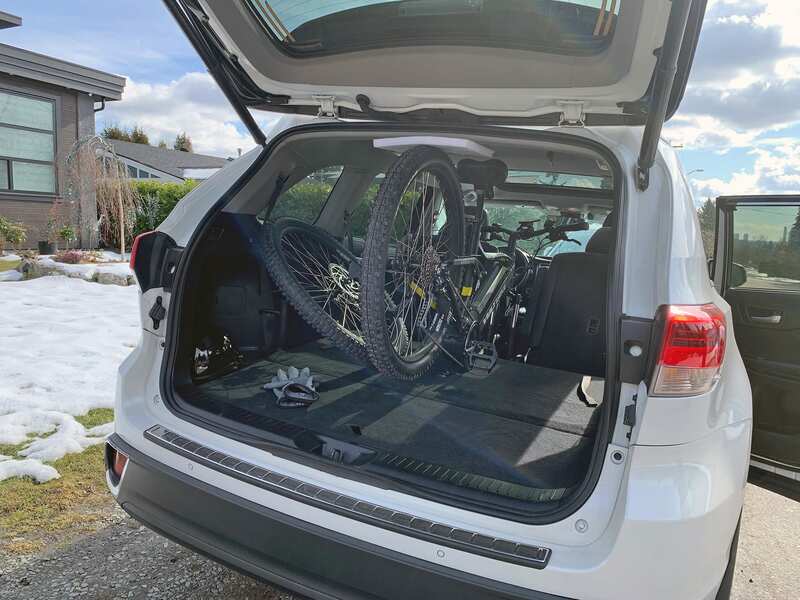 To really care for this and other lithium-ion packs, I have heard that storing in a cool dry location vs. extreme heat or cold will extend the life and try to keep it about 50% full when not using for long periods so you won’t stress the cells. Try not to let it run down to zero, because that’s really hard on the cell chemistry. 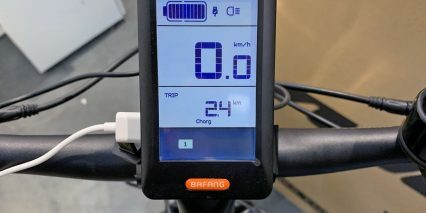 The display panel used to gauge performance and change electric assist handling is from Bafang and I believe it’s the DPC10 or some variation. Although the battery USB is a little weaker for charging, the display here has a great USB port that can support full charging for devices like iPhones. I like that the display feels solidly mounted but still swivels to reduce glare. 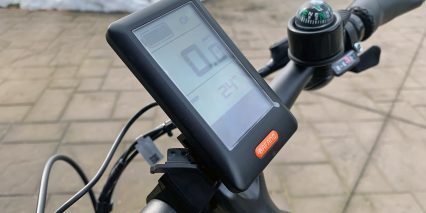 It comes with one of the larger button pads with a key for lights and information as well as power, plus and minus. Compared to the Bosch button pad, this one isn’t as physically intuitive and might require a glance down. On two occasions, I pressed the information key and had it stick down because it sort of angled sideways. While it is easy to reach, fairly compact, and appears to be water resistant, it just feels a little bit cheaper and the wire running back to the display seemed short. Another cable seemed too short and that was a pretty important one… the shifter cable leading back to the eight-speed Shimano Acera derailleur. When I shifted to the lowest gear (the largest sprocket) the cable seemed very tight. I didn’t have a problem, but this is another area to be careful with and possibly adjust if there’s extra length up front. 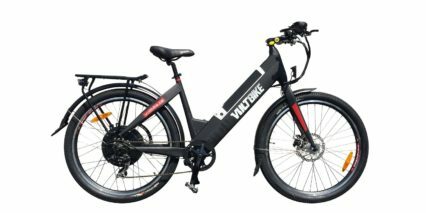 VoltBike has been very proactive and responsive based on my past reviews and while I believe all of their bikes are produced overseas, they seem to be doing well enough to make incremental improvements and provide feedback that isn’t just ignored by the factory. The truth is, you’re getting a lot of value here for $1,999 and a little bit of attention during assembly can go a long way. I highly recommend having a shop give it a full tuneup for ~$80 if you can. 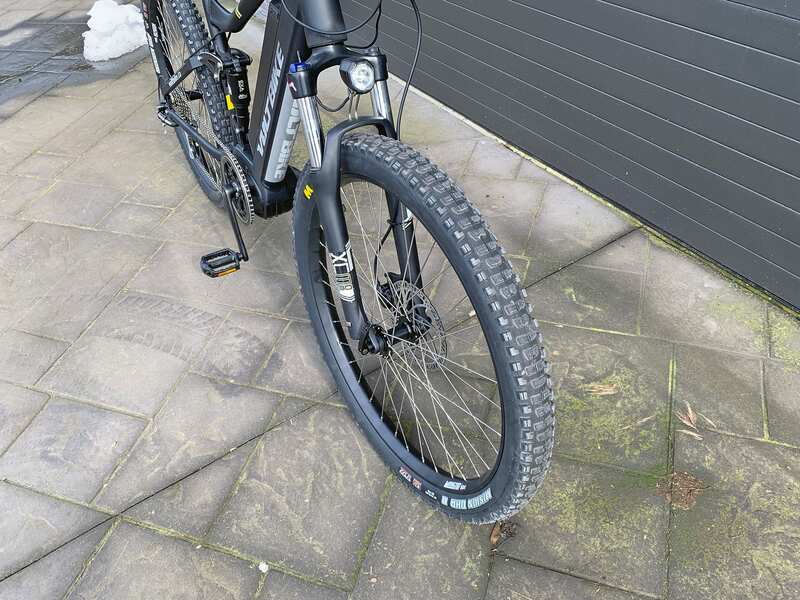 This will make it ride better and last longer because the wheels will be trued, the derailleur will shift properly and they may add grease to the pedals as I did, to reduce creaking. 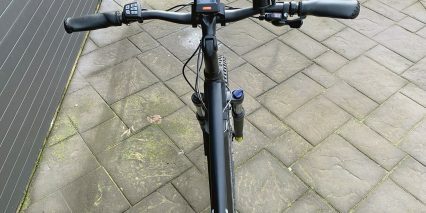 The Enduro has always been a great lower priced full suspension bike and this years upgrades make it even better. There are a few tradeoffs to note however. 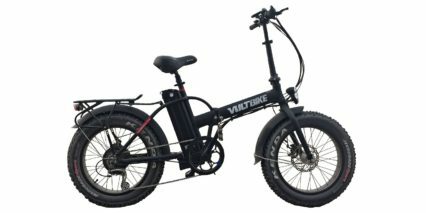 For example, some of the smaller complaints would be that there are no bottle cage bosses, the 2amp charger is kind of slow for such a high capacity battery, and the fork mounted headlight means the visibility will be compromised with potential bouncing. But probably the most significant point to consider would be the very concept this bike may give off. The full suspension and name Enduro call to mind aggressively tacking mountainous terrain. 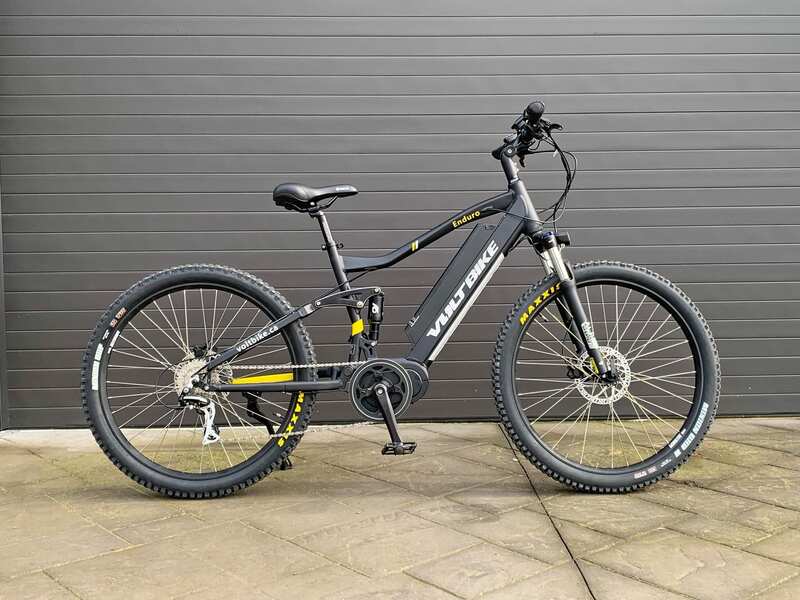 However, with adjustable stem and non adjustable rear suspension, this is more of a cross country style bike than something that is trail rated through and through. 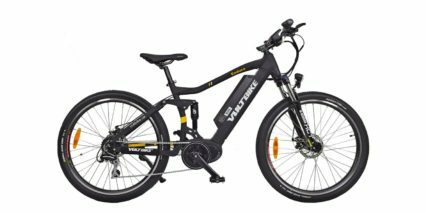 That’s not to say the bike isn’t great… For $1,999, you get a high capacity battery, full suspension, 1 year warranty and even comes with a tool kit and a DOT approved helmet! 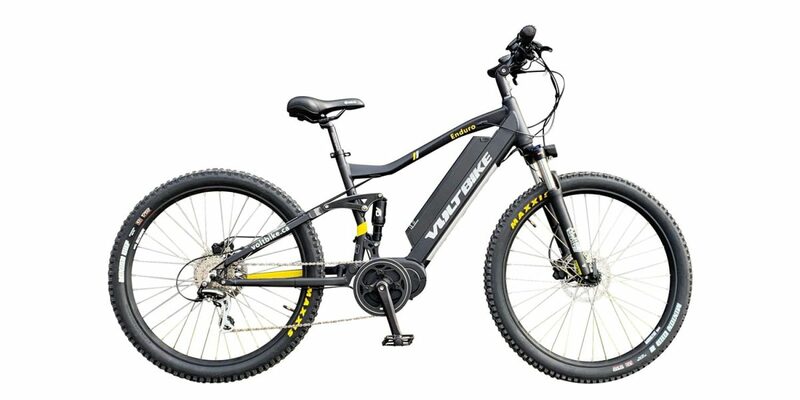 Pair that with a smooth ride and great hydraulic brakes and you get an amazing option that is light on the wallet. 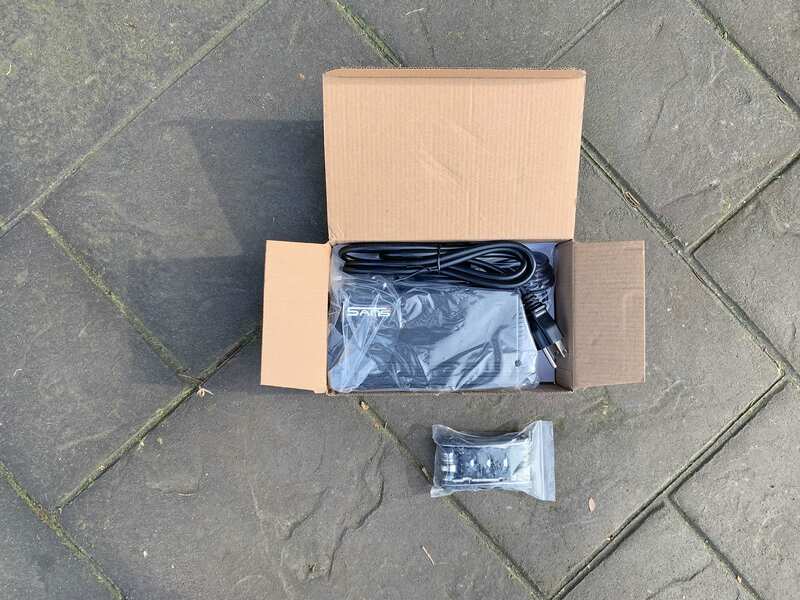 You can order the bike online and not only are there instructions for assembly, but it also comes with a free helmet!